121 years ago today, Women in New Zealand become the first women in the modern world to receive the right to vote. But for women in England, years of struggle lay ahead. 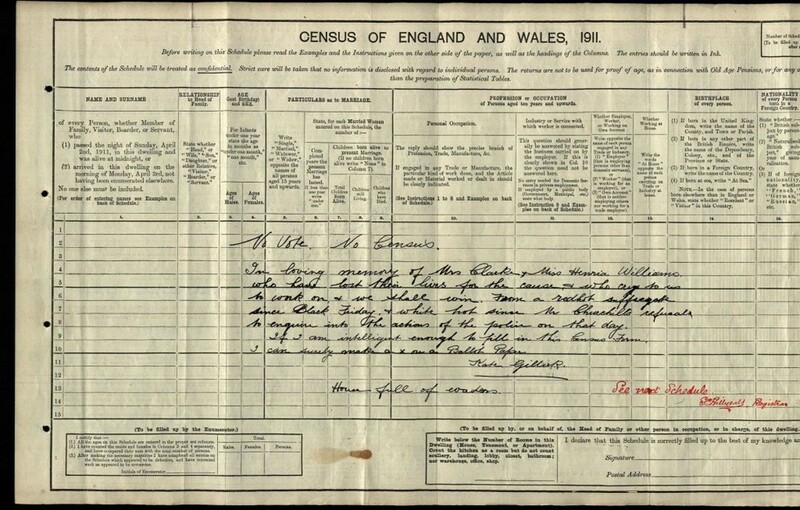 On the night of 2 April 1911 census enumerators were collecting the details of households across the country. 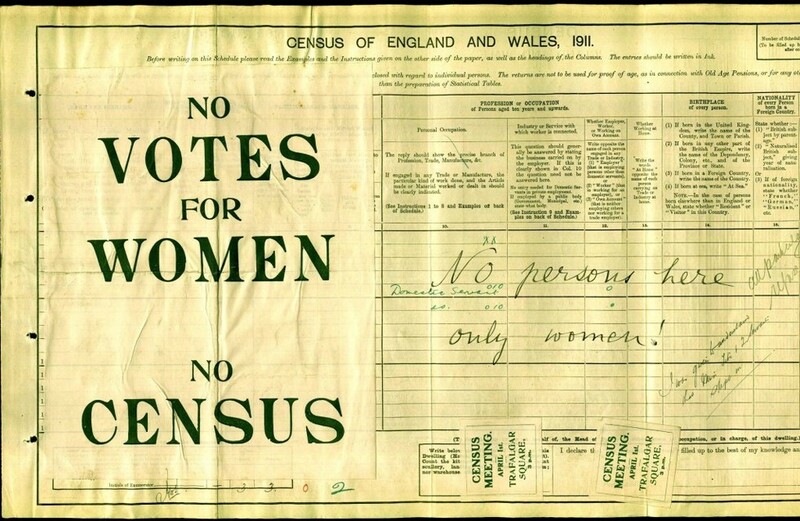 Still battling towards their goal of universal suffrage, tens of thousands of women decided to boycott the census by resisting being counted in protest at the government’s refusal to grant them a vote. Many women hid and attempted to confuse enumerators by travelling to different addresses throughout the night, while other opted for a more creative approach. The Women’s Freedom League launched a campaign inspired by Gandhi’s principle of passive resistance encouraging women from all over the UK to return their forms ‘spoilt’. Their supporters filled in forms, not with their details but with slogans such as ‘I don’t count so I won’t be counted’. When searching the 1911 census, you may occasionally come across examples of these protests. Ranging from sarcastic quips to serious political statements, they are an amusing reminder of how certain records can do much more than simply listing an individual’s biographical details. They provide a remarkable insight into the attitudes of many women at the time and allow us to hear suffragette's individual protests in their own words. In this next example we can see that Miss Mary Howey of Cradley, Hertfordshire proudly daubed a large 'Votes for Woman' slogan on her form. She listed her occupation as 'artist and suffragette ' and her infirmity as 'not enfranchised'. Our next example takes on a more somber tone. A Miss Kate Gillie dedicated her protest 'in loving memory of Mrs Clarke and Miss Henria Williams who lost their lives for the cause'. Black Friday occurred on on 18 November 1910 and was the first recorded incidence of police force used against a suffragette protest. She cites Churchill's reluctance to investigate the matter as a cause for further inspiration and declares "if I am intelligent enough to fill in this census form, I can surely make an x on a ballot form". She defiantly signs off by declaring her home a "house full of evaders". Katherine S. Dreier used her Census form to swear her allegiance to the cause. She declared that she had "joined the brave women of England in their distinguished protest against the systematic blocking by the government of the women's conciliation." Our final example is an amusing reminder that many husbands did not support their wives' political beliefs. At the bottom of the form, in red ink, you can see Company Director Arthur Edward Maund's attempt at correcting his wife's attempted sabotage. He wrote; "unfortunately, my wife being a suffragette put her pen through her name. He dismissed his wife's act of protest as an attempt by "a silly suffragette to defeat the object of the census, to which as head of the household I object". 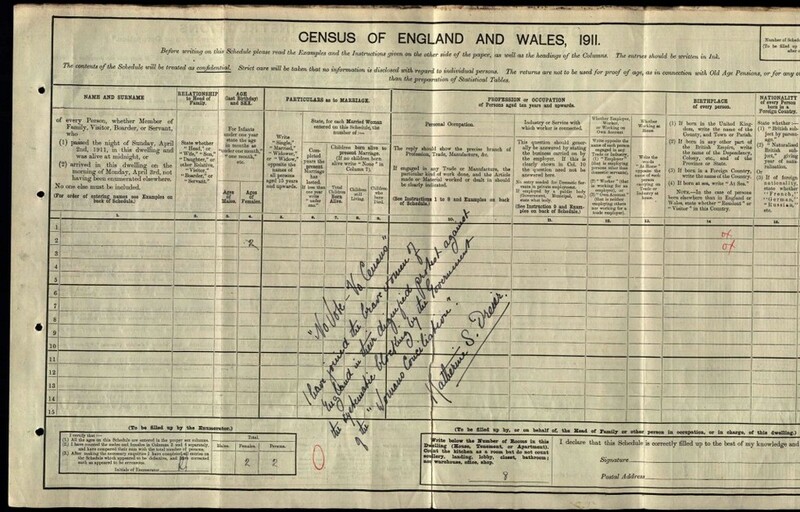 These fascinating records serve as snapshots of British history at an individual level and got to show that you can never be to sure of what you may find when searcing the census. 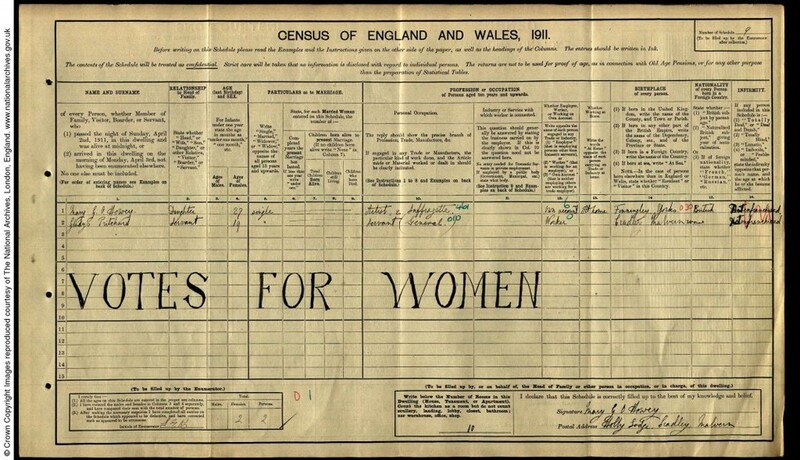 If you had an ancestor who was involved in the suffrage movement then search for them in the 1911 census to see if they chose to evade the enumerators or made a similar protest. If you have an interest in the history of suffrage movement, why not try searching for prominent activists in the census and in our collection of historic newspapers. 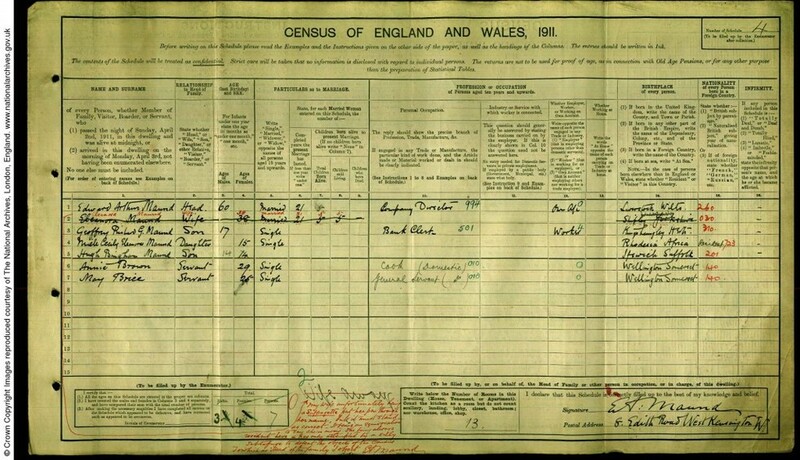 What will you find in the 1911 census?